Click on the symbol for the associated item(s) in our Price List. Latest Self Adhesive Paper Types - listing upright and inverted printings (updated to 4th Apr 2019). 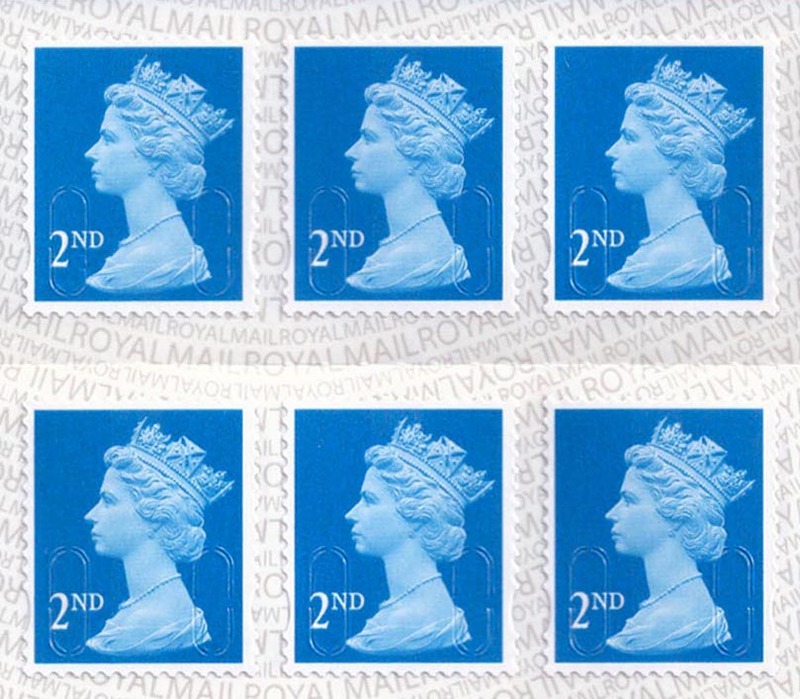 The self adhesive paper substrate with the 'ROYAL MAIL' wavyline text under the stamps (on the carrier paper) first started to appear in January 2016. 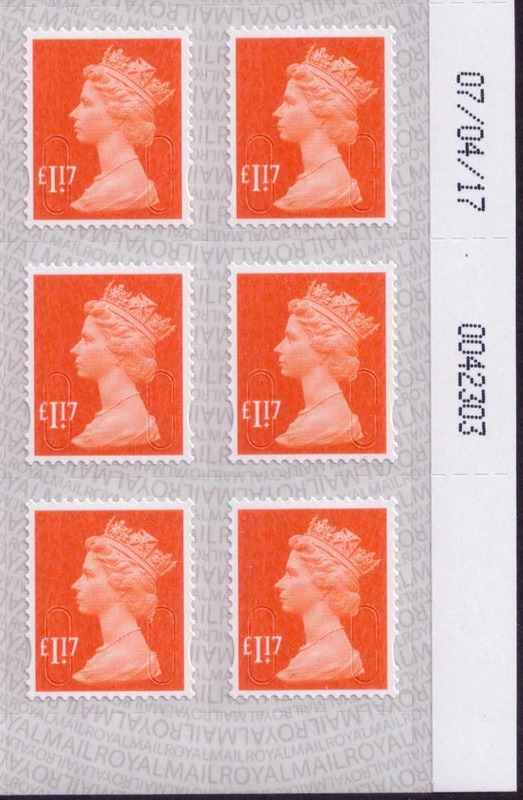 In this original form, just two lines of repeating 'ROYAL MAIL' test were printed - one line of large text and one line of small text. This first type of self adhesive paper substrate can only be found on Business Sheets and Booklets - it was not used for Counter Sheets. A revised format was then adopted and this first appeared in late January 2017. Alternating pairs of lines of the text are arranged in either upright or inverted orientation. Apparently, the change in paper type was done to aid in the production process. 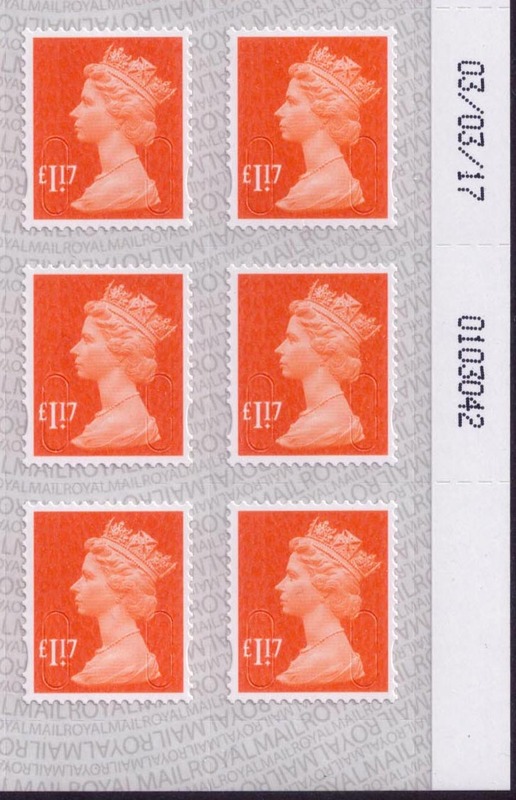 It was first found on the 2nd class Business Sheets of 100 dated 15/12/16 - the stamps having the year code 'MI6L'. Booklets (12x2nd and 12x1st) started to appear in February 2017 and then Counter Sheets in April 2017. With the introduction of the revised self adhesive paper substrate we have the possibility that printings can yield a new variant depending upon how the paper was reeled. This can be illustrated using the £1.17 value. The second printing in March 2017 (printing date 03/03/17, this was the first printing with the new substrate) was issued with the paper direction that was different from that of the Walsall 100x2nd Business Sheets (as mentioned in the paragraph above). Subsequently, a third £1.17 printing occurred in April 2017 (printing date 07/04/17). The direction of paper was different for this printing and was in the same direction as that of the first Walsall 100x2nd Business Sheets. This paper substrate has a reference code 'SBP2' and 'SBP2i' for the inverted version. For simplification, if the two lines of upright text are considered, we have L(arge) text followed by s(mall) text for the upright substrate - SBP2 and s(mall) text followed by L(arge) text for the inverted substrate - SBP2i. All these Business Sheets have the revised Chevin typeface. Conv. Date column : The date printed on the back of Business Top Panels is not the date of printing but a conversion date. This is when the printed web is taken out of stock and 'converted' into the Business Sheet (Matrix stripped away, sheeted, etc) - note : 100x2nd 24/01/17 and 25/01/17 with year code MI6L. All these Booklets have the revised Chevin typeface.